Air quality could be a bigger danger than that second portion of fries. Research into air quality levels around the globe has some bad news for early morning joggers and the bike-to-work crowd – it's possible for air to be so dirty that the benefits from exercise are negated by all the black bits you're breathing in. The researchers looked at the damage done from breathing in the very smallest of particles associated with modern-world air pollution, those ranked at PM2.5 or lower; tiny specs of particulate matter less than 2.5 micrometres in size, typically generated from the masses of engines trundling angrily around urban areas. In Riyadh, for example, the statisticians say that 45 minutes of cycling in its low-grade air would expose the biker to enough fumes to start taking as many years off their life as staying fit adds on -- what they call the "tipping point" of air quality, where exercise starts doing more damage then good. Cyclists in Beijing get to enjoy the roads for an hour before the cumulative effect of the smog starts undoing the good work, with the most polluted cities that have shameful PM2.5 levels of 160 micrograms per cubic metre mean cyclists start pedalling toward a metaphorical grave after just 30 minutes of cruising at a leisurely pace of 14 kmph. Londoners can breathe a little easier. 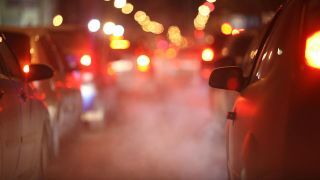 Even with London's rules-breaking levels of pollution it's still not high enough on the filth chart to start undoing the benefits of exercise, with air pollution expert Audrey de Nazelle from Imperial College saying: "The benefits of active travel outweighed the harm from air pollution in all but the most extreme air pollution concentrations. It is not currently an issue for healthy adults in Europe in general." That said, those releasing fitness apps in Allahabad, Delhi, Xingtai, and some of the other shamed polluted areas might want to start thinking about encouraging users to stay inside on the worst days, lying on the floor to be safe, and rewarding safe, shallow breaths. At the very least, it'd make the USP of a fitness tracker with an air-monitoring sensor built in a feature worthy of consideration.